"Delicious sweet-and-tangy slaw! The perfect topping for a pulled pork sandwich or as a garden-fresh summer side dish." 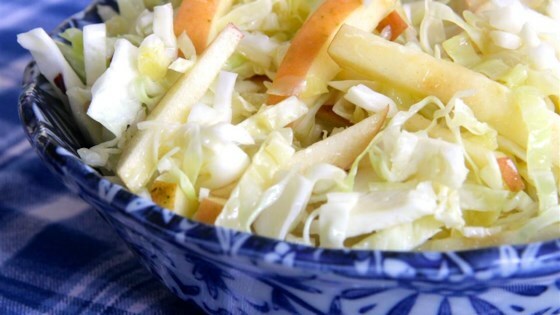 Toss cabbage, apple, and onions together in a large bowl. Whisk vinegar, sugar, olive oil, vegetable oil, Dijon mustard, and red pepper flakes together in a saucepan over medium heat; bring dressing to a simmer. Pour hot dressing over cabbage mixture and toss to coat. Cover the bowl with plastic wrap and refrigerate until flavors blend and slaw is cold, at least 1 hour. This delicious dessert looks and tastes fancy, but whips up in minutes. If you are making this to last more than a day it is best to salt the cabbage, let it wilt for an hour, then rinse and dry chopped cabbage before the slaw. This removes water from the cabbage, helping it to stay crisp longer. I like this a lot but I believe next time I will do as other reviewers suggested and decrease the sugar and oils. It works! i used red onion but it went so well with the apple. Def used very little sugar and more chilli flakes. it makes me want to eat cabbage more often!